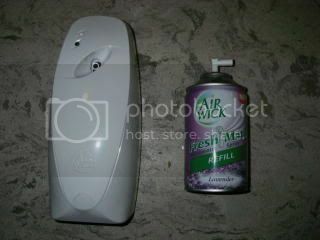 Many aerosol products including air fresheners use butane gas as the propellant. It is cheap, readily available, gaseous at room temperature but easy to compress into a liquid in the can and also a very good solvent for mixing with the oils it is used to spray out. 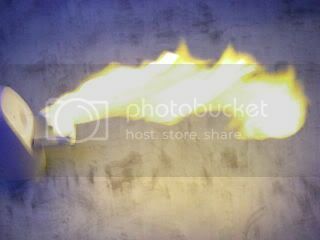 It's also flammable and can be used to project quite sizeable flames if ignited as it exits the aerosol container. Rather unsurprisingly the last feature is the most important in this project, since it just so happens that there are a number of automated units available that squirt measured portions of aroma laden butane into the air on a regular basis. These are just begging to be turned into automated flame throwers. 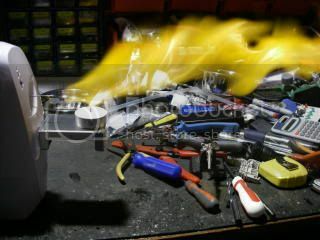 Because fuel needs to be mixed with air to burn properly, the risk of a flashback into the can is very low. 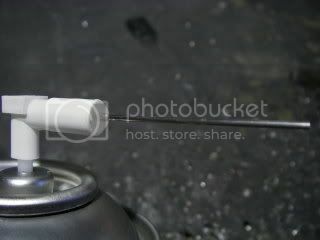 The contents of the can are almost pure fuel with no air, so no combustion should be able to occur until the gas exits the spray nozzle and mixes with air. This project has a high risk of burns, chemical allergy, solvent asphyxiation, more burns, explosion, complete house destruction and odious aroma, and therefore should not be attempted by anyone. Here's the candidate for modification. 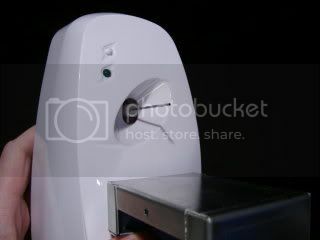 It's an Air Wick Fresh-Matic unit which has a motorised assembly that pushes the aerosol cans plunger down to release a measured dose of stinky stuff on a regular basis. This unit is based on a commercial unit that is used in many public toilet areas for smell control. The difference is that Air Wick have disabled/removed the light sensor which would normally have allowed the unit to turn itself off at night time when the lights in the room are turned out. With the Fresh Matic it continues dosing 24 hours a day, presumably to ensure that the unit will operate in dark houses and also make sure the cans don't last too long! The aerosol cans used with this system have a dosing system whereby a small burst of spray is released every time the plunger is pressed down. 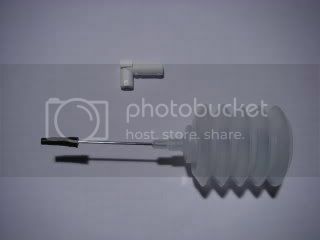 The plunger is activated by a simple motorised cam which winds down against the plunger and then stalls at the end of travel. When the motor is de-energised the spring in the cans plunger mechanism pushes the cam back up. Because the spray nozzle is recessed into the dispenser and also tends to burn a bit after a dose has been ignited, I decided to add a small stainless steel tube to the nozzle. This came from an empty inkjet refill bottle. Initially I thought I would get away with just drilling a small hole in the end of the nozzle and jamming the tube in, but it transpired that the spray does not come up a central hole, so I had to drill the nozzle out and resin the tube in. 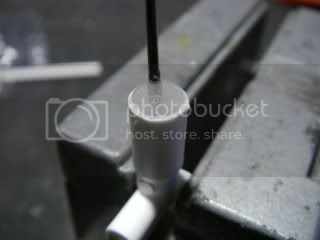 Here's the completed nozzle with it's new extended and somewhat less flammable tip. The whole assembled unit with the new nozzle sticking out and an aluminium platform for a tea-light candle which will be used to ignite the spray as it comes out. It's worth noting that I have to carefully hold the new nozzle down as I close the unit, since it needs to be guided into the outlet port. I tried a fancy new version of this spray dispenser with a built in PIR (Passive Infra Red) detector that lets the unit detect people walking about and increases the frequency of the sprays, but the sensor was triggered continually by the heat rising off the candle! The first test on my bench. Another test in a somewhat less cluttered area. Here's a YouTube video showing the unit in action.